There is a parenting tactic that falls into that category for me. A parent is trying to get their kid to do something and they won’t. They tell them a couple of times to no avail. Then the parent starts to count, “1…2…” The tactic theoretically is that when the parent gets to 3, the kid has to obey or something bad will happen. Usually the kid responds by 2. Sometimes the kid goes to 3 and and allows whatever to happen. Since I only observe this in public, I can only speculate if anything actually happens to the kid that dares to disobey past 3. Much like pajama pants, I believe this is a bad idea. I don’t judge in the harshest sense of that word, because I recognize that many people who read this are using this tactic. I certainly am not one of those single guys who is judging you at Wal-Mart who has no clue about what it’s like with small kids. I have been there. I went through that phase twice. Wait, I’m back there again. I have a 3 year old right now. I understand that it is hard with small children. FYI: older kids are much the same just with a more extensive vocabulary. I do, however, caution against doing this. This can be frustrating for you and confusing to the child. It also has the potential to reinforce the behavior that you are trying to prevent. Typically you start the counting method because you are having a hard time getting your child to obey and you are frustrated because they aren’t listening and they don’t respect you. So you start “laying down the law” by telling your kids that there will be serious consequences if they don’t obey. They will know consequences are coming with the counting. However, when you start counting, you are already frustrated. When they don’t obey until the last possible second, you are still getting upset and feeling disrespected. So it’s not helping you in that regard. “But Cloften, at least they are obeying.” Sure, at least sometimes, but is that really the only or even primary goal of what you are trying to teach your kids? “As long as I get eventual obedience, then I’m being a successful parent.” God is calling us to do much more in the lives of our kids than to receive eventual compliance. This tactic is also confusing the kid. They may not know that they are confused, but they are. You are communicating to your child that they have a choice in obedience. They get to decide when they are ready to obey. They should not have that choice and you should not be giving them the impression that they do. When they are asked to do something by a parent or an authority, they must comply, immediately. When you don’t do this, you are also communicating to them that sometimes you don’t mean what you say. Your child moves when they believe that you are serious. You didn’t really mean it until you started counting. They learn this because there are no consequences for not listening at first and because there are times (You know there are) when you give up asking before you start counting. If they can keep playing, they will. When you are serious, they will obey. Our kids need to know that what we say is what we mean. Don’t say it if you don’t mean it. If you mean it, enforce it. So what I suggest instead is that the consequences begin when the first act of disobedience occurs. They don’t have to be severe, but there needs to be a consequence for not listening. Your children are under authority and it is your responsibility not to simply get them to comply eventually, but to discipline them. They need to learn submission to authority and humility. Their teachers will not count, their coaches will not count, and their bosses certainly will not. I know that it is hard and kids are relentless. “If I got them in trouble every time they didn’t listen, they would always be in trouble, and I would be exhausted.” That would be true, at least for a while, until you establish the better pattern. You are already exhausted, you might as well get the discipline and obedience as well. Then with kids that are listening and obeying the first time, you can sit back and relax…in your pajama pants…but only at home. The husband is not loving his wife, the wife is not respecting her husband, and they lack the ability to communicate about it well. This is Paul’s summary statement about what a marriage relationship needs to look like. He is describing what wives’ and husbands’ greatest needs are in marriage and how the other spouse is supposed to meet them. When we can understand what this verse is asking from each of us, learn to implement it well and begin to have healthy conversations with our spouse about it, then we will see God produce healthy marriages in our homes. What you are about to get is a relatively brief summary of the piece of advice that Heidi, my wife, and I have given countless times to numerous couples. One of the hardest things that people say to us when we are counseling them is “We’ve been married _____ years and no one ever told us that.” This idea is what the Bible says is the key to marriages working, our experience has backed it up numerous times and people don’t know because they haven’t heard. That is why we talk about this in premarriage counseling all the time and why we share it with you today. We don’t want you to struggle because you don’t know. 1) The husband is called to love his wife. This is an unconditional command and the primary responsibility that a husband has to his wife. The key to success is understanding what does love mean in the context of a husband’s relationship with his wife. We have found that it comes down to 2 things. First, a wife needs to feel cherished and valuable to her husband. She needs to know that more than anything he values her. He values her more than work, sports, time alone, money, other relationships. Everything. When she believes that there are areas or people in his life that he values more, the relationship breaks down. Second, a wife needs security, both relational and financial security. She needs to know that no matter what, he is not leaving. She also needs to know that the family is going to be OK financially. He will do whatever it takes to make sure of that and won’t do anything stupid to wreck the family. 2) The wife is called to respect her husband. This also is an unconditional command. “Wait, wait, wait. Love is unconditional, but respect is earned.” False. That is not what the passage says. Both commands are given without condition. Just as a wife would say that she needs love the most when she feels unlovable, a husband needs respect when he feels unrespectable. This also breaks down into 2 parts. First is words of affirmation. He needs to hear from you that you think that he is a great man and a great husband. He needs to know that you believe in him. Second is sexual responsiveness. (Yep, I just said that.) You being into him physically like he is into you makes him believe that you fully trust and respect him. 3) Learn to talk about this well. Understand yourself well enough to know why you are getting angry. You aren’t angry with your husband because he is messy with his dirty laundry. You are angry because he is showing you that he doesn’t value you or your time enough to pick up his stuff. Who cares about socks on the floor? You care about how he values you. You also aren’t angry with your wife for asking too many probing questions about your day. You are upset because you feel like she doesn’t trust you and is checking up on you. Knowing why you are upset and being able to communicate that makes a huge difference. The same goes for understanding why your spouse is upset. Again, this is just a primer. There is much more that could be said. You can anticipate a lot more in-depth analysis on how we can understand and live out these three principles well over the coming weeks and months. I leave you with this to think about. The issue that has you so upset right now—chores, money, golf, personal space—is that really why you are upset? If not, what is it really? What is it about those specific problems that triggers such a big response from you and how can you communicate that better to your spouse? These are typical questions exchanged in a typical family on any typical day. The questions may be different. The answers may vary. But the sentiments are the same. The problem with the daily question ritual is that it frequently frustrates both the asker and the asked because it requires the recounting of unimportant facts and does not lead to the true connection desired by the asker. Depending on your personality and relational dynamics, you may find yourself usually the question asker, usually the asked, or occasionally both. I am frequently the asker, pumping my husband and kids for information to give me a window into their lives and a taste of the outside world that most stay at home moms are starved for. However, I am also guilty of rolling my eyes and gritting my teeth before answering inquiries of, “What did you and Laylah (3) do today?” from my well-meaning husband or kids. 1. What you need to know: The heart behind the questions is connection. Viewing the person drilling you with unwelcome questions as a person who wants to emotionally connect with you, rather than the equivalent of a buzzing mosquito will radically change the tenor of you interaction. Look for ways to connect with the question askers in your life. Offer them your eyes (rather than a view of the back of your phone). Recognize the love they feel for you and how much they value you. 2. What you need to know: Information is power. Yes, the details of what you did today are unimportant. However, sharing those details with a loved one invites that person into your world and communicates that you value him/her and want to connect. Answer the questions. Place their desire to connect above your desire to avoid tedious questions. Value others above yourself. 3. What you need to know: Asking someone to rehash their day rarely leads to true connection. You ask, “How was your day?” but you want to know “How are you?” Invite people to talk about things they want to share about. Questions they want to answer lead to answers you want to hear. Let’s push outside of the easy and mundane questions to draw our family members into real conversation. Better questions will lead to better answers. And the next time someone you love asks, “How was your day?” resist the urge to eye roll and take a moment to be thankful you have someone who asks! I was 23 years old and had been married for a little bit over a year. Our first year of marriage had not gone well. My first year as a college minister had not gone well. I was not doing well. I was neck deep in some private sin. I was failing as a man. It was one of the scariest seasons of my life. I was scared and failing, and I wasn’t sure how to get out. Everything was new. I had never been married before, and I had never had a full-time year round job before. I was crumbling under the pressure. I was supposed to be some great Christian and mentor to college students, and I wasn’t. I had an awesome wife and she needed me to be more and better than what I was. I’m getting a huge knot in my stomach right now just recalling this time in my life. Have you been there? Have you ever had a truly low point in your life where you felt like you were failing in all or most facets of your life? Most of us have. If you haven’t, I don’t want to jinx it, but… What are you supposed to do in this situation? We live in a world that is struggling. We live in a world where people are having a hard time making families work. Marriages are falling apart. They have fallen apart so badly that more and more people have given up even on the idea of marriage. People are struggling to raise healthy, confident kids. We are not even sure what that phrase means any more. The world is looking for answers everywhere. They are looking everywhere except in God’s Word and from Christians. Why is this the case? It is because we have failed to provide the world an example of what a healthy growing family can look like when it commits itself to God’s plan and design for families. Our divorce rate is as high or higher than the country as a whole. Our kids struggle with their identity as much or more than any other kids. We sit back and criticize that “the world is falling apart.” However, we fail to realize that the world is falling apart in large part because we have failed to be the light that God has called us to be as his church. They are failing because we as God’s people have failed in being who we are called to be. Why is this the case? Because we have failed as individuals and as families to get the help we need when we are struggling. We have decided that faking it and pretending to be doing fine when we aren’t is preferable to being honest. We choose to be fake with each other because we care more about people thinking that we are doing well, then we care about actually doing well. Then, on the rare occasions that someone finally decides to break down and admit that they need help, we far too often choose to rebuke them for needing the help in the first place. We individually and collectively need to make a decision to be different. Back to the flashback. I was at the lowest point in my life to that point. I was failing in almost every way that a man could be failing. My wife and I had just joined a new small group. In this group was a couple that was just a few years older than we were. They had just had their first child, a beautiful baby girl. As we were getting to know them, I began to really like him. He seemed to be the kind of husband, dad and man that I wanted to be. Then I made one of the best decisions of my life. I asked Stuart out to lunch. At that lunch, I just put it all out there. I told him all the ways that I was struggling. I can only imagine how overwhelmed he must have been in that moment. I asked him for help. I asked if we could meet, talk, anything. I needed help in being a better man. Thankfully, he agreed. We decided that we were going to have lunch together every week. We would ask each other some accountability questions and just talk about how we were doing with our wives and in our work and our personal lives. Thus began my relationship with the best friend that I have ever had. Over the last 20 years, at every major step in my life, in every up and especially the downs, Stuart has been right there beside me. He has helped me and sometimes carried me through some of the scariest moments in my life. If I am anything, if I am a good husband, good dad or good pastor, it is in large part, because of the friendship and faithfulness of Stuart. I am, literally, eternally grateful for him. I may not be great at a lot of things, but one thing that I have done well is I have asked for help when I need it. Life is too hard for me to try it alone. I need help. I need someone who has been where I am to point me the right way. I need people to help me get out of a hole when I can’t do it alone. I need someone to pray with me and for me. I need friends. I need help. One of the best decisions in my life was on a random Wednesday night when I asked someone I barely know to lunch and then the next day, just simply asked him for help. What about you? How are you doing? Really. If you’re not doing well, does someone know it? If you need help, have you asked anyone for help? God has given us each other and His Spirit. Don’t go it alone. Get help. I was 23 years old and had been married for a little bit over a year. Our first year of marriage had not gone well. My first year as a college minister had not gone well. I was not doing well. I was neck deep in some private sin. I was failing as a man. It was one of the scariest seasons of my life. I was scared and failing and I wasn’t sure how to get out. Everything was new. I had never been married before, and I had never had a full-time year round job before. I was crumbling under the pressure. I was supposed to be some great Christian and mentor to college students, and I wasn’t. I had an awesome wife and she needed me to be more and better than what I was. I’m getting a huge knot in my stomach right now just recalling this time in my life. Back to the flashback. I was at the lowest point in my life to that point. I was failing in almost every way that a man could be failing. My wife I and I had just joined a new small group. In this group was a couple that was just a few years older than we were. They had just had their first child, a beautiful baby girl. As we were getting to know them, I began to really like him. He seemed to bet the kind of husband, dad and man that I wanted to be. Then I made one of the best decisions of my life. I asked Stuart out to lunch. What about you? How are you doing? Really. If you’re not doing well, does someone know it? If you need help, have you asked? God has given us each other and His Spirit. Don’t go it alone. Get help. It is hard to imagine that it has been so long since I’ve blogged that there is nothing on here about Laylah. For those of you who don’t know, Laylah is our 3, almost 4, year old daughter. For those keeping score, that means we have 3 daughters–17, 14 and 3, all with birthdays this fall. People always make a face when they hear the spread for the first time. “Got a surprise, huh?” “Yeah, but not how you think.” I’ll tell you the story some time in the future for sure about how God brought the awesome Laylah Sue Loften into our lives, but that is for another day. Today we are talking about adventures. About a year ago on a Saturday morning, mom was headed out garage saling (Red squiggle for saling, huh? So “to garage sale” is not a verb? Agree to disagree.) and Laylah was not happy so I asked her if she wanted to go on some adventures. Not exactly sure why I used that word, because what I had in mind was not, by most definitions, adventurous. That perked her up quickly and we were on our way. As we were getting in the car, I asked her what she wanted to do first. She said that she wanted to go to the gas station and get a sucker. Adventure! So we went to Kum & Go (Where & Means More!) and she got a sucker and I got an obnoxiously large fountain drink (The smallest drink is the medium and it’s 32 oz). I was hungry, so we then went to Chick-Fil-A (Home of the Original Chicken Sandwich) for some breakfast. Adventure! The Chick-Fil-A we visited happens to be next to Barnes and Noble (Unleash Your Imagination) and Petco (Where the Healthy Pets Go). So after lunch we went to “The Pet Shop.” Adventure! Then we went to “The Story Store” (You see the story store is different than a library because you have to buy the stories instead of take them home with you). Adventure! After about two and a half hours, she gets tired and she is all adventured out. We go home get some lunch and she passes out for a nap. Little did I know that I had begun a weekly tradition. This is now what my Saturday mornings are–always. In the last year, we have expanded our repertoire. We go to Toys ‘R Us (Where a Kid Can Be a Kid) sometimes and occasionally run the aisles at Wal-Mart (Always Low Prices). We also have southern adventures with a different Kum & Go and Chick-Fil-A, but includes the Fayetteville Public Library (strengthening our community and empowering our citizens with free and public access to knowledge) and the Farmers Market (where our commitment to fresh, locally grown produce and goods has helped Northwest Arkansas grow into a healthier and greener community) Adventures!!! We do some version of this every Saturday we are in town. We’ve even been known to do it in Branson (There’s Only One…) on occasion. Too Much Adventure! Laylah asks almost every day if tomorrow is Saturday or “Adventure day.” It is one of the highlights of her week and mine as well. We have a blast together. For a relatively small investment of 2-2 1/2 hours, I get so much. She knows that I love her and that I value spending time with her. She is building up a huge memory bank of a dad that consistently and lovingly gave her part of his time. I’m building up the same memory bank. Big picture, there is going to come a day when her eye is going to be looking to other guys. The more I serve and love her, the less and less likely it becomes that she will settle for some selfish guy that wants something from her but gives nothing. I am teaching her what it means to be loved by a man, what a dad is, and in 50 years or so, when she starts dating, I want her standard to be high. Dads, I can’t say this to you enough. Search the site, and you will see that I have been saying this for years. You need to start now, investing personal regular time in your girls. You need to love and date and serve them. The payoff now and in the long run is huge. It doesn’t take a huge investment–you’d be surprised how much mileage I can get out of a 20 cent sucker. While the investment can be small, the dividends will echo for eternity. Honestly, I’ve also felt very stretched in my professional life and blogging got moved to the back. I thought a couple of times about starting back, but I realized that I didn’t want to be a once every week and a half blogger, which is probably the best I could have done. Decided it was better to wait until I could do it well. Random leadership insight implied from previous paragraph: Don’t do something new, unless you can do it well. Don’t start something new until you are doing all the other things you’re supposed to be doing well. Random Husband/Dad insight implied from that unintentionally sexist statement: Be careful what you say around your wife and daughters. Your words matter. They are listening. You can crush and inspire with each statement you make. This precious baby has been in our home for almost 2 months now and is doing great and has completely and totally captivated each and every one of us. There is a great chance that she will become part of our “forever family” (cute expression from adoption circles) and we couldn’t be more excited. For those keeping score, that is a 14 year old, 11 year old and 2 month old. In the meantime, we have to be discreet about talking about her publicly, showing pictures, etc. This is a way to honor her and her natural family during a very hard time. So again, you want to know what I’m thinking about. Stuff I can’t really talk about with pictures I can’t show. I would destroy this blog and eat the computer if it meant the safety, protection and honoring of this precious gift. Random pastoral insight from previous paragraph: Family first. Wait, wait. I worry what you just heard was family is important. What I said was: family first. Do you understand? So the blog is back. I will occasionally have coded things to say about the world’s best baby who, by the way, has slept 8 hours 2 of the last 3 nights. How Do You Think I’m Doing as a Parent? If there is a list of questions we would never ask anyone, this would have to be near the top. I’m not talking about the list of questions we shouldn’t ask like, “Would you like to see my toe warts?” This is a question that we would never want to ask. You see, I preached a sermon yesterday on parenting. I’ll have to admit I was quite nervous all week leading up to it and was especially nervous giving said sermon. Why? My perception, right or wrong, is that people don’t want you to meddle in that area. We desperately want others to believe that we are great parents and have great kids. We certainly don’t want anyone telling us that we don’t. However, is there anything more important that we do than raise our children? We are shaping the lives of small children, instilling values, pointing (or not pointing) them to God, learn right from wrong, building their self-image, setting the foundation for the rest of their lives, etc. If it is this overwhelmingly important, why would we not want help or feedback? (Was that rhetorical?) Because we don’t want anyone to think that we are failing, because it is that important. 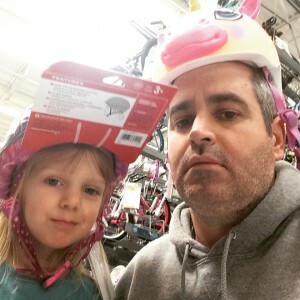 There’s a line my wife and I throw around, “We would rather people think we have great kids, and we know better, than we think we have great kids and everyone else knows better.” What? We want to have kids that are polite and confident and good to be around, but we know that they have challenges and we are working on them. We don’t want to think we have great, fun, spunky amazing kids and secretly our friends are trying to get out of having to hang out with us. It is highly unlikely that you are failing as a parent. You’re loving them right? You are trying to teach them right and wrong? You are most likely doing ok. But what if by asking a few questions, you could be doing better? What if there were some small adjustments that you could make to improve? Wouldn’t you want to make them? Ask someone. Ask your spouse. Ask yourself. Pray and ask God. This is incredibly important. That’s why I talk about it all the time. I’m constantly evaluating myself. I want to get better. That’s why I blog about it as well. You think I’m a great blogger, don’t you? Please feel free to comment openly and honestly about that. Say all the amazing things about me that you want. I will have to ask you here to not judge me. You know how you can be sometimes. We have a few birthday traditions around our home and we had another successful birthday yesterday. My wife Heidi, who I contend is not aging at all, had her birthday yesterday. She shares it with Phil Mickelson, my favorite golfer, but I love her more. I’m pretty sure I’m the only who has ever seen this episode, and I haven’t watched the Simpsons in probably 15 years, but this dumb little clip stuck in my head. It used to make Maylee furious. “I am not a boy or girl. I am a girl!!! !” In a different home, that would have modified the dad’s behavior. Not here. That tradition is silly. Here is one that is not. The birthday “boy or girl” gets to pick where we eat. Then while we wait for the food, we all go around and share one thing we love about the birthday “boy or girl.” We typically make about 3 laps around. It’s a great opportunity to take some time and do some intentional appreciation. The birthday “boy or girl” loves it, even if at times it seems a little cheesy. BTW, this same routine is done for Mother’s Day and Father’s Day. On our anniversary, which we call our family’s birthday, we do the same thing. This time everyone shares what they like about being a part of the family. First there was the Toenail Ogre, then Family Tag Month. Now perhaps the most intentionally goofy family you know brings you something completely different–Family Topic Month or Family Chat Month or something like that. Maybe it needs a better name, but it’s a cool concept. Everyone in the family will put discussion questions or topics in a jar. You can put as many as you want in the jar. Every night, with TV off and sitting around the dinner table (Something we can do now, since this is one of two months that isn’t soccer season, and we are currently not in any plays. ), we will pull one of these out and we will discuss it. Last night’s intro discussion was Mom’s question: What is one thing you’ve learned about yourself this year that you like? What is one that you don’t like? Unlike most things we do, there is no competition. This is just being intentional to talk about deeper things together as a family. BTW, the final results for Family Tag Month were Mom and Lauren had 7 points (points are bad), I had 8 and Maylee had 9. Lauren was the winner. She had 0 times where she woke up “it” and went to sleep “it,” without remembering to tag anyone else, which is very lame. Mom had at least one. Lauren gets to plan on her own, a family date night. So far it includes Hugo’s and one of those weigh your own yogurt places. She’s not sure what she wants the activity to be, she said maybe Gator Golf.